Wilson doing super-powered humans just has to be a good fit. Doesn't it? Come June we'll all get a chance to find out. I am DONE with traveling. Finally. And I, of course, had a pile of book awaiting me in addition to a few picked up on the road. Between a trip to New Orleans and one to Los Angeles I visited some great stores including a legendary store in LA. But first my NOLA nabs. One of my first stops was, of course, to a local bookstore soon after I got to town. New Orleans is rife with indie stores and some specialize in having some hard-to-find books such as Thomas Ligotti's Grimscribe seen above in its British First Edition format found at Crescent City Books. Plus, it was signed to Michael from Ligotti so it fits in perfectly on my shelves. I had a nice chat with the Michael who originally had gotten it inscribed along with many other Ligotti works. I'm still on the hunt for a copy of The Nightmare Factory though. If Sub Press ever gets to Nightmare, as they have with Ligotti's other books, I'll bite for it. The next few came from Dauphine Street Books, which is one of those dusty, cramped stores where the books have splilled out into the aisle so badly you can't even see all the books without moving piles around. In other words: book heaven. 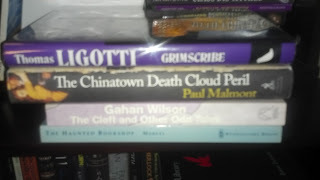 What first caught my eye was a HC first edition of Paul Malmont's The Chinatown Death Cloud Peril, which I couldn't resist for less than the cost of the paperback. I spotted a copy of Gahan Wilson's The Cleft and Other Odd Tales at the bottom of a pile and had to have it since I read a couple of his shorts recently and loved them. The Haunted Bookshop by Christopher Morley was suggested by the owner. And aho I am to turn down suggestions? 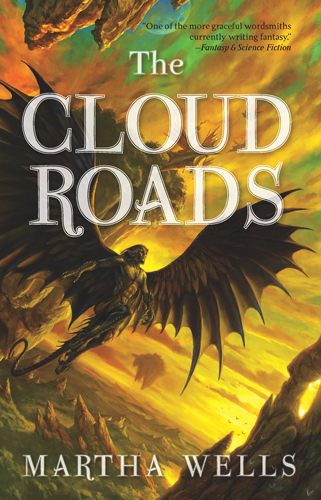 Awaiting me at home were Seanan McGuire's Discount Armageddon, which is putting cryptids into Urban Fantasy. 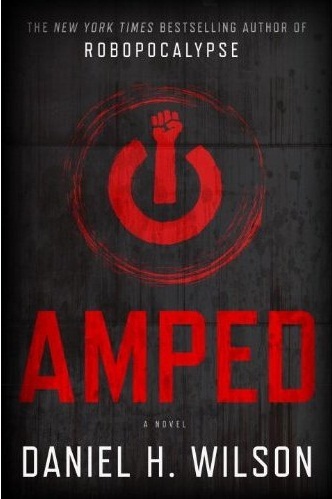 Despite the cover I'm interested especially since the first October Daye surprised me in a very good way last year. I'm most excited by Andre Norton's classic Forerunner, which Tor is reissuing as its been on my reading bucket list for awhile. Flatscreen by Adam Wilson was a surprise as I had it on my to-buy list. I don't get a lot of non-genre books for review despite reading plenty. Then again I review those type of books infrequently.Titan Books has some exciting stuff brewing continuing their push into reintroducing classic pulp characters such as like the Fu Manchu series by Sax Rohmer and the original pulp superstar Sherlock Holmes with the Further Adventure series. 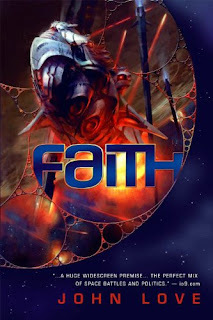 Next is The Night Sessions by Ken McLeod, his latest Sci-Fi Thriller to be released by Pyr come this April and Erin Hoffman's second Chaos Knight book. At the bottom is Card's latest Endervese book following Bean into space. On my trip to Los Angeles I literally happened upon the famous genre store Mysterious Galaxy. My wife was driving towards the ocean to find a place for dinner and I told her stumbling upon it was a sign that we had to go. The one thing I noticed about the store is that they aren't afraid to stock complete long series runs, while most stores would only have the the latest book or two or at a long shot the last three. 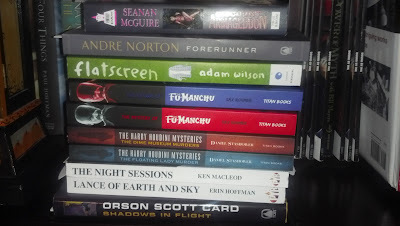 There were also a fair number of signed books since Mysterious gets on so many author tours. But I was looking for the unusual since my own collection is fairly filled out with popular genre books. First Kim Stanley Robinson's novelette The Lucky Strike stood out despite its diminutive size. Even though I already have a copy of Malmont's The Astounding, The Amazing, and the Unknown I couldn't passed up a signed first edition since I got Chinatown in its first edition in NOLA. I had to make the Malmont sandwich complete. 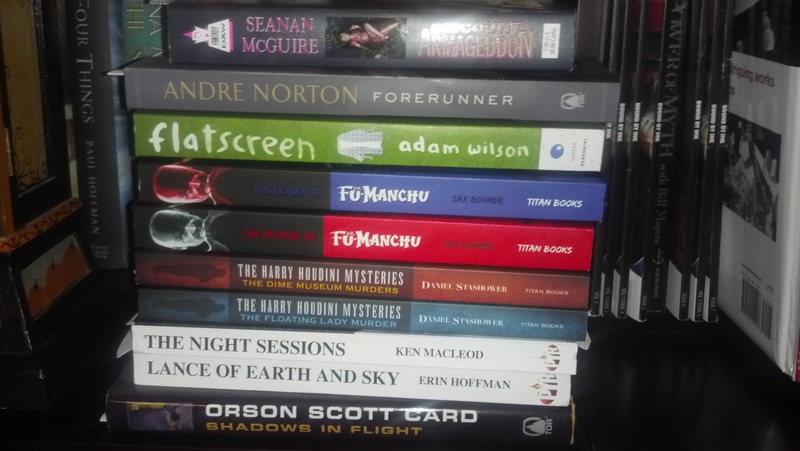 The next few were review copies awaiting me on my most recent homecoming. I've been reading Nancy Kress' short work for years, but have never read anything long so I'm looking forward to trying out After the Fall, Before the Fall, and During the Fall very much. I'll probably read it next. 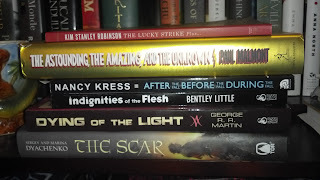 Sub Press also sent me Bentley Little's latest collection of short horror stories Indignities of the Flesh. Although I didn't announce it too formally a personal reading goal this year is to read more Horror. Sub Press is also doing a limited edition of one of GRRM's early novels Dying of the Light, which I originally read 7 years ago when I was going through A Song of Ice and Fire withdrawal. Lastly is the Sword and Sorcery influenced The Scar by Sergey & Marina Dyachenko, which looks all kinds of pretty. 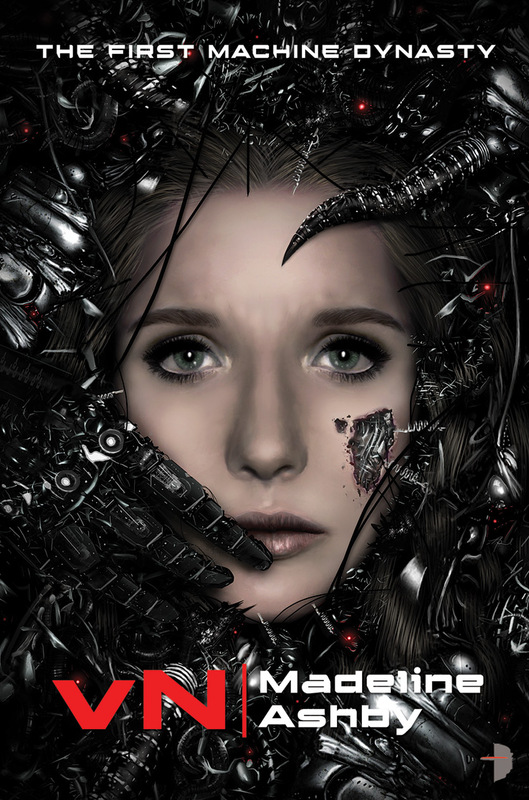 Amy Peterson is a self-replicating humanoid robot. vN is scheduled for an August release and it is one I'll be watching for. As this post goes live I will be on a short vacation, but clearly I have not forgotten you, my loyal readers. I could never. The night I was packing my now built-in bookshelves were just about finished. A few details are still to come, but the below shows the close to finished product. Some may remember that I purchased 4 bookshelves from Borders during their going out of business sale. That's right even though Borders is gone they will not be forgotten, at least in my house. I purchased them even though I had no place for them at the time with the plan of installing them in my next house. They sat for months in a dusty corner of a warehouse my company was kind enough to let me use. Just recently I put my old place on the market and moved into the house I'll eventually buy (when my place sells) and had them installed along with some other remodel work we wanted done to the room. Seen above is now what I referring to as "The Library." This is a long-time dream coming true. A very talented friend is doing all of the remodel work and started by chopping off the top 6 inches or so of the bookcases in order for them to fit in a room with a slightly lower than average ceiling. They are being finished off with gorgeous stain grade trim wood top and bottom. I chose a red-ish stain for the trim to make it standout against the light birch of the cases. Want a close up of that trim work? I thought you would. Jealous yet? I thought so. At the very top is what is known as dental trim. It is called dental apparently because it looks like rows of teeth. So my shelves now have quite a bite to them. Below that is a trim piece with a nice leaf design that goes along with other fixtures already in the room or to be installed. None of the shelves are sorted at this point except for this one with a lot of my favorite genre books from the last few years, which still needs to be monkeyed with a bit more. That white door leads to a catchall closet with lots of storage space and is what I now called "The Hypercube." Why? Because why not? "Honey, where do you want this box?" And if you were curious these cases comprise about half of my book collection. Across the room are my old freestanding cases, which are not quite as packed as they once were. 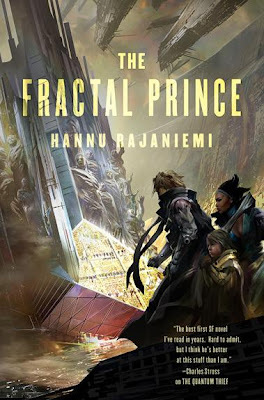 The sequel to Hannu Rajaniemi's extraordinary debut novel is set to build on the extravagent promise of one of the most exciting new voices to come out of the genre this century. Jean le Flambeur, posthuman thief, is out of prison, but still not free. To pay his debts to Oortian warrior Mieli and her mysterious patron the pellegrini, he has to break into the mind of a living god. Planning the ultimate heist takes Jean and Mieli from the haunted city of Sirr on broken Earth to the many-layered virtual realms of the mighty Sobornost. But when the stakes of the pellegrinis game are revealed, Jean has to decide how far he is willing to go to get the job done. On the edges of physical space a thief, helped by a sardonic ship, is trying to break into a Schrodinger box. He is doing the job for his patron, and owner of the ship, Mieli. In the box is his freedom. Or not. The box is protected by codes that twist logic and sanity. And the ship is under attack. The thief is nearly dead, the ship is being eaten alive. Jean de Flambeur is running out of time. All of him. And on earth, two sisters in a city of fast ones, shadow players and jinni contemplate a revolution. There are many more stories than can be told even in a thousand nights and one night, but these two stories will twist, and combine. And reality will spiral. In Hannu Rajaniemi's sparkling follow-up to the critically acclaimed, international sensation THE QUANTUM THIEF, he returns to his awe-inspiring vision of the universe and we find out what the future held for Earth. 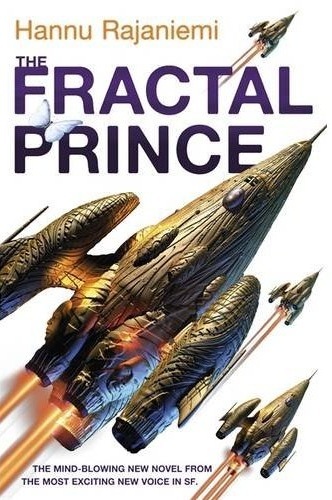 The US cover was released sometime ago and again graced by wonderful Kekai Kotaki art. The Fractal Prince will be released in the UK from Gollancz and Tor in the US come this September.